“Zener Diode Tester is controlled by Arduino Nano. Tester measure breakdown Zener voltage for diodes from 1.8V to 48V. Dissipation power of measured diodes could be from 250mW to a few Watts. Measuring is simple, just connect diode and press button START. Arduino Nano gradually connect range of voltages from lower to higher, in four steps. For each step, current is checked through measured Zener diode. If current is over zero value (not zero), it means: Zener Voltage was detected. In this case voltage is displayed for certain time (adjusted by software to 10 seconds) and measuring is stopped. Current in each step is constant through all voltages in that range and is decreasing by increasing step number - voltage range. To maintain power dissipation for higher voltages, current in this range must be reduced. 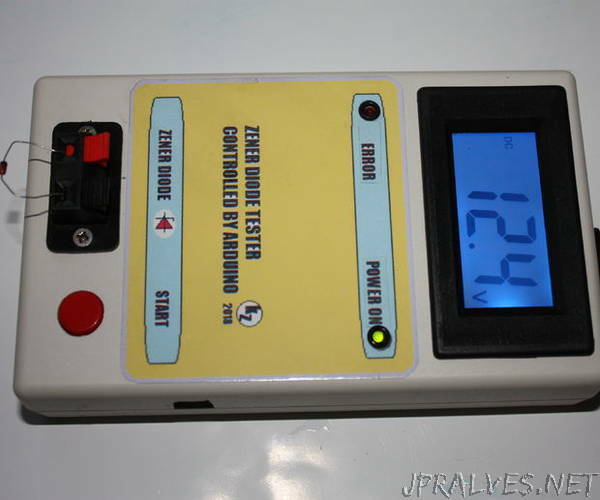 Tester is designed to measure diodes from 250mW and 500mW. Zener diodes with higher power, could be measured just the same way, but measured voltage value is lower for about 5%.